Wonder Girl Knits: take me out to the ballgame. so many of you have heard about Seattle's Stitch and Pitch. What a great idea...finally making the boredom of a baseball game productive. With Baby Alpaca. you might not be able to tell from the picture. but this sock is HUGE. i mean, gigantic. i am hoping that some man i know will be able to scrunch it into a mean pair of hiking boots, but i don't know. this thing just keeps growing. so i keep starting all these socks, but the real question is: how do you make a heel? 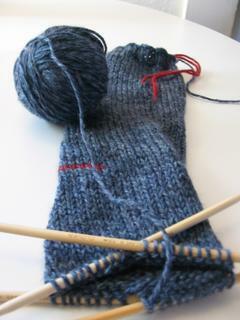 with this pattern - the heel is knitted out after you finish the sock. but i am looking for a pattern that knits the heel as you go...any suggestions out there? also - you might have noticed that i am fooling around with the colors of our blog. i just couldn't take the "mean green" anymore. but since i haven't really worked with html since freshman year in college - it's all a bit fuzzy. it will come back me, but for now...we have this nice blue hue.